Rex finds his owner! WHAT TEAMWORK! 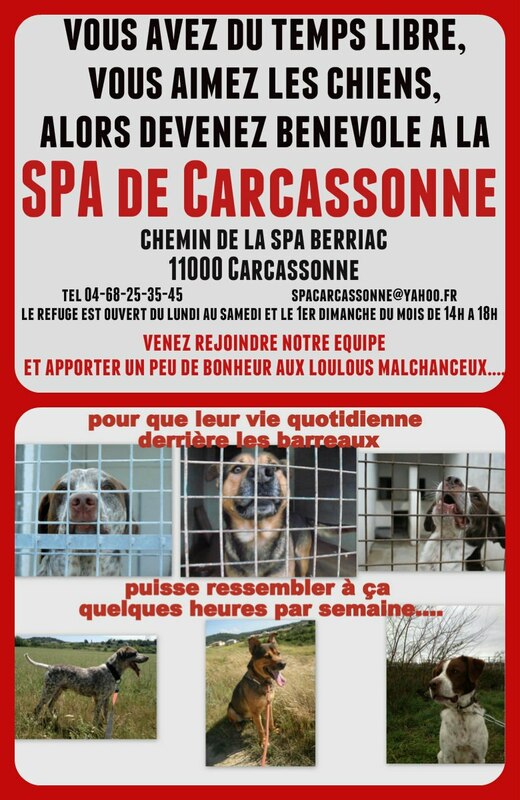 On March 15th Rex was brought to the SPA. He was chipped but his owner is a homeless person and the only phone number we had was that of a local shelter which acts as a post restante for many of Carcassonne’s homeless. We left a message there, but poor Rex was crying in his box, and we didn’t want him to stay for too long. So one of our multi-talented volunteers went into “poster mode” and made this poster, which my husband then took to the soup kitchen, where he volunteers. 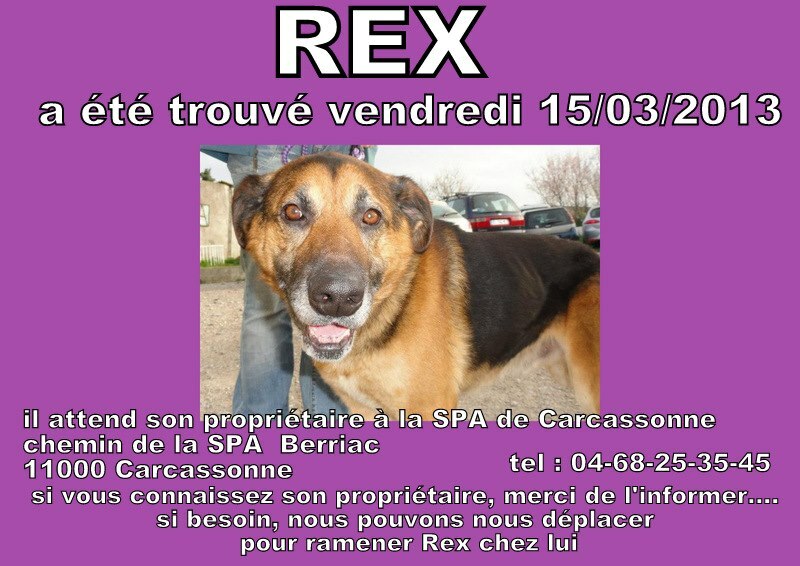 Straight away someone recognised Rex and promised to get in touch with his owner. He in turn called the refuge today and Melissa, our secretary, delivered Rex back to his owner tonight. The reunion was very emotional; it nearly had Melissa in tears. Homeless people can make excellent dog owners, by the way, and Rex is in excellent health, so we are glad he is back where he belongs. A happy ending for everyone! Busy day, some good news. I couldn’t believe how quickly the time flew by at the refuge today. It was all go for me and the other dog walkers! We had a visit from a new handy-man type volunteer who looks like he could be a godsend to the SPA. 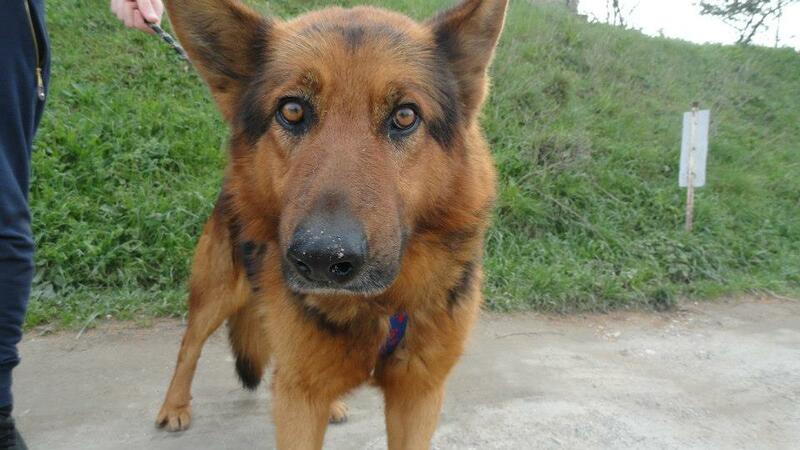 And out of the blue, Hector, our lovely German Shepherd, was adopted to be the companion of a golden retriever. Hector had arrived having been hit by a car, and initially had trouble walking, so there were no nice photos of him in the sunshine until Saturday, when a volunteer took him out, and the resulting photo is what attracted his new owners to the refuge! Hurrah! Lovely Belle’s adoption was confirmed by her foster family, and we are all working like mad to find a new home for Harley. Oh, and Pippa (see below) has been reserved! Quite a day, all in all! Then as well as needing a temporary foster home for Alexia before she goes to Belgium, the adoption of Harley fell through. So tonight’s blog is dedicated to Harley. I have posted for him before, but this time I MEAN IT!!! Harley is a small to medium dog, about 15kg. He is fine boned and is possibly a podenco cross. He was born in September 2009 and spent well over a year at the refuge before being adopted. However his adopter couldn’t keep him, as Harley has separation anxiety and barked while she was at work. Rather than him go back into the refuge, a volunteer took Harley home to foster, and he has made enormous progress. He is still quite anxious by nature and doesn’t like being alone, but the barking has become manageable, and his foster carers would happily keep him, were it not for the fact that they have house rabbits, and Harley is not at all okay with rabbits. He is, however fine with cats. And female dogs. And non-dominant males. 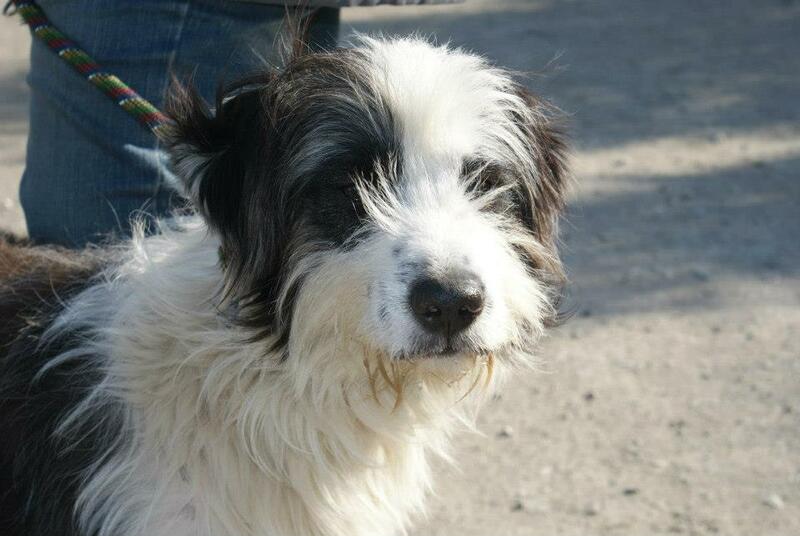 Harley is fabulous on the lead and is affectionate in the extreme. We really don’t want Harley to come back to the refuge, as all the progress that has been made on his separation anxiety will have been wasted. 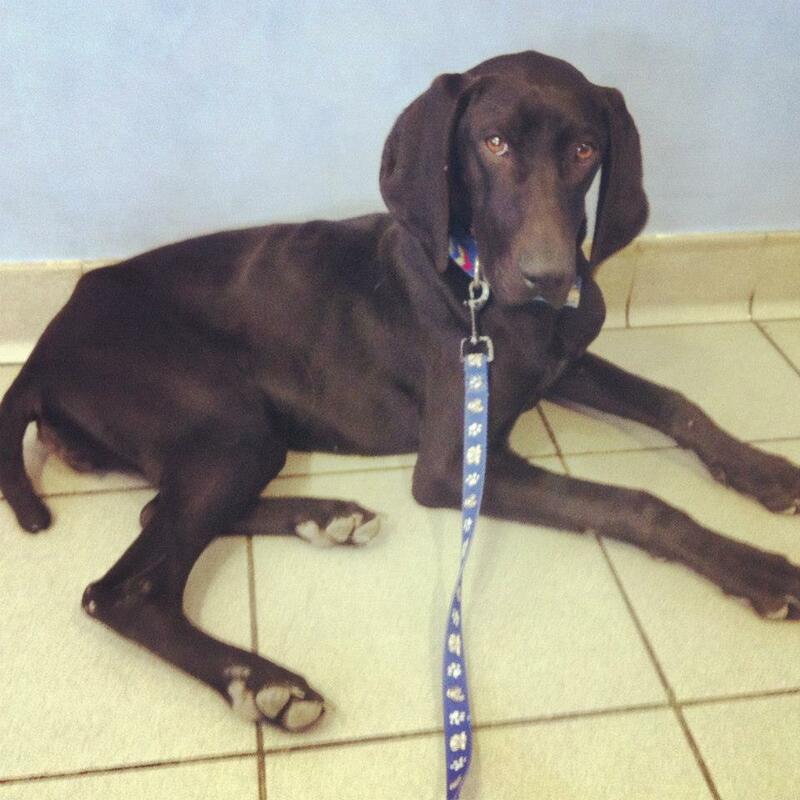 Harley is castrated and is the perfect dog in so many ways. Neither of his recent homes has had a garden, and he loves running round, so he would love a garden and he definitely needs another dog in the family, as he needs a canine mentor. Despite the wonderful number of dogs who were adopted yesterday, one thing that struck us was how few volunteers there were at the refuge. Of course, everyone has a life and weekends are special to many people. But apparently there is the misapprehension that we have loads of volunteers on Saturdays, so people deliberately don’t come along so as to not “get in the way”. One of our most devoted volunteers (who drives up from Narbonne two afternoons a week, despite working full time) has made this lovely poster, which is now on the Facebook page. Maybe it will inspire a few more people to join us. More volunteers means more potential foster families! If you fancy joining us, please get in touch. NOT a typical day at all! Wow. I am exhausted. Today we had 6 dogs adopted, including 2 of the Perfume litter (together) and the last of the Planets. There are still puppies left, though, so don’t give up if you are after a baby! We also said goodbye to Pasha and Mao, both of whom have featured on this blog, and also Gouda, one of our “not quite pups”. And not only this, but four dogs found their owners, giving us some much needed space. As ever there were some arrivals, including this beautiful girl, Pippa, who was spotted hanging round the refuge gates where she had presumably been dumped. She is very thin, but absolutely adorable. She is fine with cats and children and other dogs and is only six months old. But it is those long ears that could condemn her to a long stay at the refuge. If she can get over the anti hunt dog prejudice, she will make a fabulous family pet! Typical Day; good and bad. Good news in the form of a reservation for Vania, one of my favourite dogs and subject of an earlier post. Bad news in the form of the arrival of several new dogs. One thing is for sure, this is a never ending task. Dusty (below) was homed from us last year and has just been found and brought into us by a member of the public. As we have his owner’s phone number on file (thanks to the micro-chip) we were able to phone up and tell them that Dusty was safe and was waiting for them to come and collect him. They were pleased to hear that he was okay, but said that they won’t be coming to get him. So for Dusty it is back to square one. This just makes me sad and makes me wonder what sort of people we are dealing with. The thought of losing any of my 4 dogs fills me with fear and dread, yet for others they are just objects that can be thrown away once the novelty has worn off. Poor Dusty. 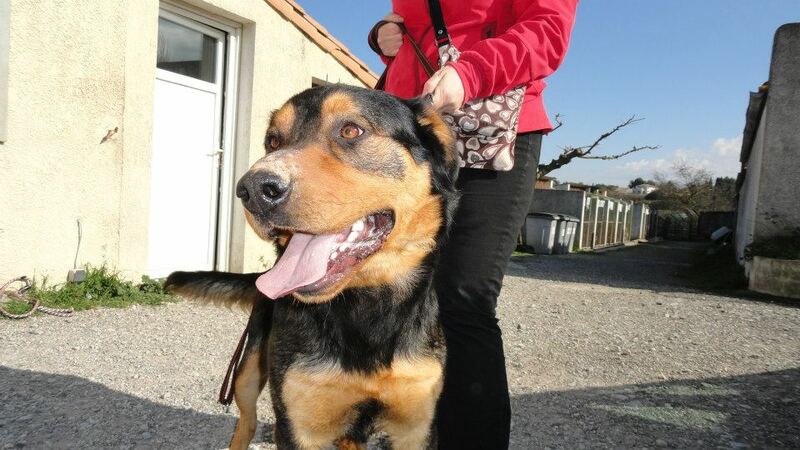 He is a beautiful beauceron of 2 and a half years old; what is he doing at the SPA again? I feel we let him down last time, so only the best will do for him now! Despite the freezing cold there was a hardy bunch of volunteers busy walking dogs and that is always good for morale. Some Sherlock-Holmes-ing has enabled us to track down the owners of 3 of our recent arrivals (why they weren’t looking actively is a matter of concern, but we are too full to be able to keep dogs that already have a home). 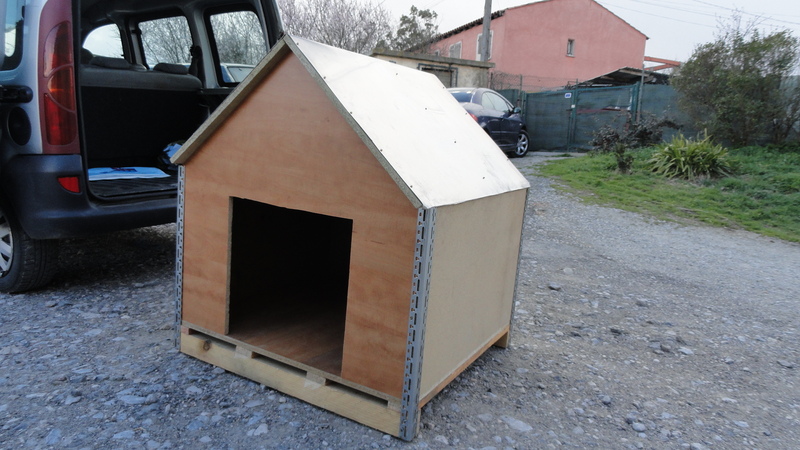 Mao was reserved and will be leaving us soon, as will Charlotte, and one of our volunteers delivered this magnificent kennel that she had made herself, all with recycled materials! Next job is to get it into the park, as I think it is too big to fit through the gates! Oh and our dog-loving volunteer handyman is back from nearly 3 months holiday, so with any luck the refuge will soon be in the midst of a much needed makeover. 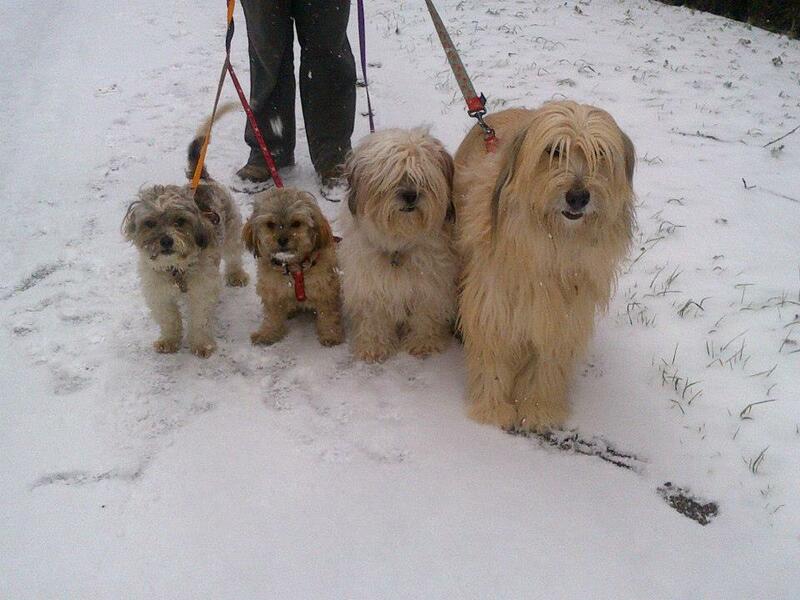 Look at these 4 in the snow. Can you recognise the two on the left? Thought not, me neither! Remember Rasta and Rocket, the two one-year old Shih-tzus who arrived in the refuge in a terrible state? Well here they are, renamed Fred and Ginger, and beautiful and happy with their new brother and sister! This picture was taken a couple of weeks ago (during the last batch of snow), but I saw their new mum and the refuge yesterday, and she showed me this picture, which I just knew I had to share with you all. These are the images that keep us going when times are rough, as they are at the moment. Not much to tell today, except our that our 11 year old lab, Tracy, is sleeping somewhere warm tonight thanks to a lovely British couple who couldn’t bear to think of her in the refuge. See, it’s not all bad news! I went to the refuge for the first time in a week today, and I was shocked to see how crowded we have become in such a short space of time. We have had 153 dogs brought in so far this year. A record for us, but not one to be proud of. And so many of the dogs are hunting types, which is so predictable and makes me so so angry, especially as these dogs have presumably given loyal service for years before being cast off. And we have had quite a few young dogs brought back, those that have been adopted as puppies, either from us or elsewhere, and dumped now they are bigger and not trained (like it is the dog’s fault). The dogs are so beautiful too. I had a lovely cuddle with Flocon today. He is just a youngster and he was so happy just to be loved and petted. It made me so sad to put him back into his kennel. I have just got back from dog training class, where I go twice a week. While I was there I had a chat to the SPA secretary, who also goes with one of her dogs. As you know, I have been away, and you only get half the story if you are relying on emails and Facebook. Tonight I found out the shocking news that we have 138 dogs at the refuge. When we had 142 dogs in summer, we went into SOS mode and we were helped out by various associations. And here we are again. It is never ending, I know, but it is very early in the year to have reached such a huge number. I am trying not to panic. There are some fabulous dogs at the refuge. 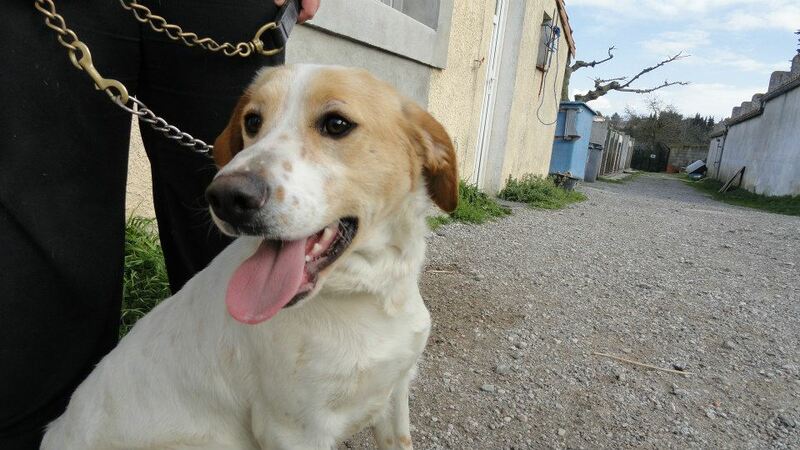 Look at beautiful Vania; she is just 10 months old and has been abandoned. Who could resist (especially hard for me, as she looks exactly like one of my dogs, Bella, who is lying at my feet exhausted after dog training).